The Community Assessment of Renewable Energy and Sustainability (CARES) is a multidisciplinary team of engineers, architects and environmental specialists at the University of California, Berkeley. 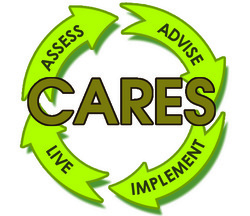 CARES was founded in 2007 with a grant from the NCIIA to address the disconnect between the creation of sustainability technological innovations by engineers and the needs of the end users. The founding members of CARES include Dr. Alice Agogino, Ryan Shelby, and Yael Perez. The mission of CARES is to enable end users to make informed decisions about sustainability and renewable energy technologies by giving them agency during the design, development, and implementation of sustainability best practices and renewable energy technologies. Since March 2008, the Community Assessment of Renewable Energy and Sustainability (CARES) has been partnering with the Pinoleville Pomo Nation (PPN) near Ukiah, CA to co-design culturally-inspired, sustainable housing and renewable energy power systems that utilize sustainability best practices, renewable energy technology, and reflect the long-standing culture of the Pinoleville Pomo Nation..